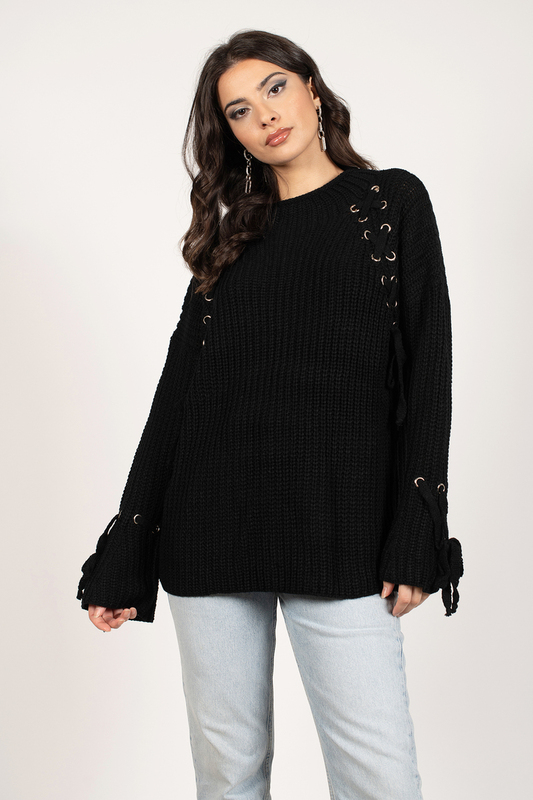 Check out Tobi's Knit Fit Lace Up Sweater Add a little edge to your sweater collection with the Knit Fit Lace Up Black Sweater. This slouchy sweater features an oversized fit, extra long flared sleeves, a mock neckline, and lace up detail at the shoulder. Style this winter pullover with skinny jeans and boots! Add a little edge to your sweater collection with the Knit Fit Lace Up Black Sweater. This slouchy sweater features an oversized fit, extra long flared sleeves, a mock neckline, and lace up detail at the shoulder. Style this winter pullover with skinny jeans and boots! Add a little edge to your sweater collection with the Knit Fit Lace Up Mocha Sweater. This slouchy sweater features an oversized fit, extra long flared sleeves, a mock neckline, and lace up detail at the shoulder. Style this winter pullover with skinny jeans and boots! Black, Mocha modeled on a size Small.